In my December 9th post I mentioned One Book December and how it has inspired me to start a Christmas Journal. I’ve been working on it and I wanted to share my progress so far. I did end up using my Celtic Colours journal. 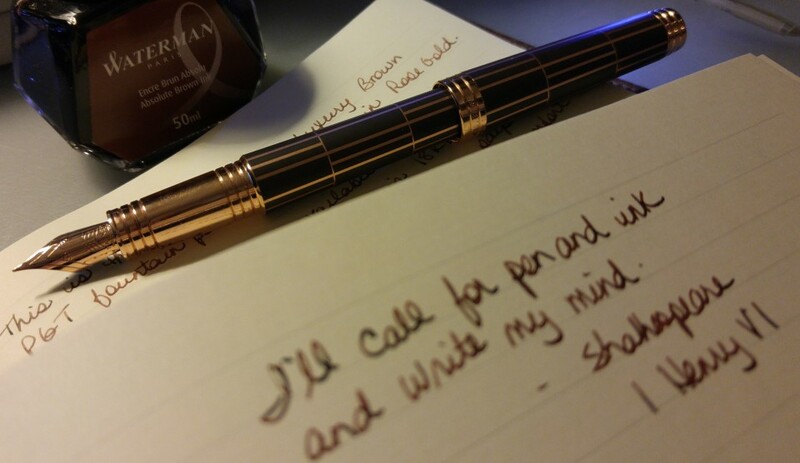 I decided to fill up the TWSBI with Waterman Absolute Brown to use as my primary pen for this journal. Here’s the first page. The paper seems super absorbent because the TWSBI usually puts down a thicker line. But the brown ink looks amazing on the tan paper. Here’s the contents page and I left an extra blank page for all of the entries. So far I have written about making our traditional tourtiere with my father, exchanging gifts with friends, my family’s Christmas celebration this year, some samples of wrapping paper from the gifts this year, and some Christmas journaling prompts. I really like this page. I love wrapping paper and in the past I have put pieces in my everyday journals over the Christmas season. So I definitely wanted to capture that in this dedicated Christmas journal. I think it adds some much needed colour to otherwise boring brown pages of writing. On this page, for the journaling prompts, I decided to change up the ink a little bit, incorporating some red and green. I’m only up to page 14 and have lots of ideas for this journal. I want to talk about family traditions and treasured memories of past Christmases. I thought I might take photos of my favorite ornaments and paste them in. Even though it would make the journal bulky I might include some favorite Christmas cards too. I’ve been conscious of having an audience for this journal some day, so there are recipes and observations and facts, details of family celebrations and gifts exchanged. Not a lot of emotion in these pages but that’s ok, I have my every day journal for that. I wanted this book to be a positive memory keeper for myself and for others who might read it down the road. We have so much to be grateful for and I hope my writing reflects that sentiment. Merry Christmas everyone. If you love beautiful writing, take a moment to read Ratika’s blog, Scribblings of a Storyteller. She writes with an intense honesty I find addicting. Thank you for sharing your soul Ratika. I stumbled upon this post on The Journal Diaries category of the Seaweed Kisses blog and I was really taken with the double columns and ink/pen changes by the author, Ellina. And she uses a Seven Seas Writer from Nanami Paper! Of course she does. Just amazing visuals, of her pens and her journal. Love this blog: Journaling Sage. She has these fantastic journal prompts that she puts on stickers and sells in her etsy shop. Great stuff! I love her tutorial on painting the stickers with watercolor. People ask me how do I stay motivated to write? I find it hard to answer because I need to write every day and it comes easily to me. Just as playing an instrument or solving math equations comes easily to others. But I found this post on michaelhyatt.com really interesting. He uses a journal template for his daily journaling. It keeps him regular and consistent. He answers the template questions digitally but you could easily apply this to a written journal. I love his emphasis on what he has learned and what he is grateful for. Excellent ideas. And is it just me or has everyone gone nuts for adult coloring books? I have a couple but they seem to be everywhere right now. I like to color a piece and then stick it in my journal. And this article on religionnews.com by Leslie Miller asks whether coloring and doodling can be a spiritual practice, in addition to be a de-stressing exercise. Interesting.